This distinct building on Main Street in Venice bears the signature of several major modern artists: Frank Gehry, who designed the two buildings, and Claes Oldenburg and Coosje van Bruggen, who designed the massive binoculars right in front. The buildings were commissioned to house Chiat/Day advertising agency, but the current tenant is (perhaps not surprisingly) Google. Gehry was looking for a centerpiece for his buildings and by chance, happened to place a model of a building shaped like binoculars in front of the models for his two buildings. The project came to life and was finished in 1991. 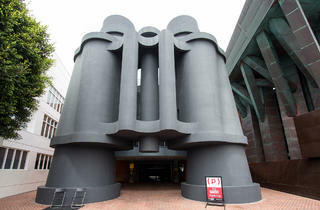 The binoculars serve as an entrance to the complex for cars and pedestrians. Gehry and Oldenburg worked previously on a project at the Loyola Law School in Downtown (Toppling Ladder With Spilling Paint), installed in 1986. 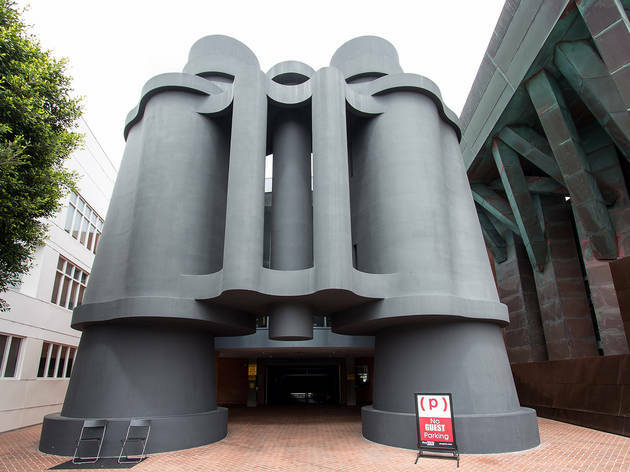 The binoculars are very much characteristic of Oldenburg's aesthetic of large-scale functional objects.